Hollywood superstar Robert Downey Jr and wife Susan have welcomed their second child, a baby girl. Susan gave birth to the baby in Los Angeles this week. The couple are already parents to two-year-old son, Exton. Downey has 21-year-old son Indio from a previous marriage, reported People magazine. Last week, Downey, 49, paid a tribute to his wife and their soon-to-be-born daughter as he accepted an award at the BAFTA Los Angeles Jaguar Britannia Awards for excellence in film. He revealed in July that the couple was expecting a baby girl. Sherlock star Benedict Cumberbatch is engaged to be married to girlfriend Sophie Hunter. The actor announced the news by posting a notice in British newspaper The Times. 'The engagement is announced between Benedict, son of Wanda and Timothy Cumberbatch of London, and Sophie, daughter of Katharine Hunter of Edinburgh and Charles Hunter of London,' the announcement read. The couple is yet to announce a wedding date. Hunter, 36, an Oxford graduate, is a theatre director and actress. 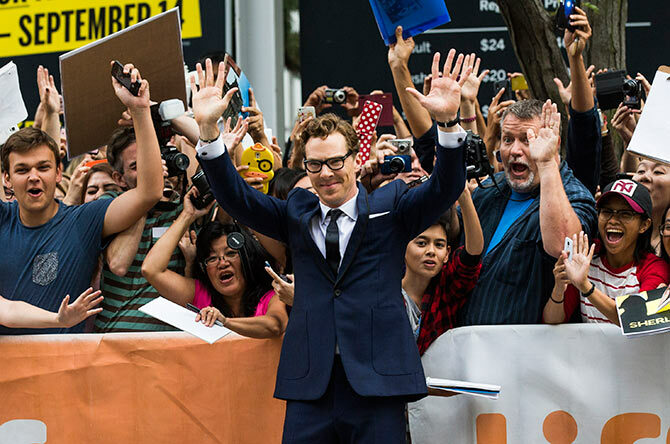 Cumberbatch has gained a huge fan following thanks to his role as the modern day Sherlock in the British show. He is in the race to make it to the Oscar short list for his role of Alan Turing in The Imitation Game. Angelina Jolie to quit acting career for politics? Rumours are rife that Angelina Jolie may quit her acting career and join politics, after she hinted in a interview that she's ready to enter politics. The A Mighty Heart star told Vanity Fair magazine that when one works as a humanitarian, they are conscious that politics have to be considered, because if they really want to make an extreme change, then they have a responsibility, Fox News reported. The 39-year-old actress said that she honestly doesn't know in what role she would be more useful, she is conscious of what she does for a living, and that could make it less possible. Jolie, who is a special envoy for the UN High Commissioner for Refugees, further admitted she is open to pursing politics. Singer Kelly Rowland has given birth to her and Tom Witherspoon's first child, son Titan Jewell. The 33-year-old star welcomed her first child with husband into the world on November 4, said her representative, reported People magazine. The former Destiny's Child singer, who confirmed she and Tim were expecting a boy earlier this year, has shown much excitement about the arrival of her first child throughout much of her pregnancy. Rowland first announced she and Witherspoon were pregnant in June, just one month after they tied the knot in a beautiful ceremony in Costa Rica. Shweta Tiwari, Action Jackson: KBC 8 grand finale is quite a show!